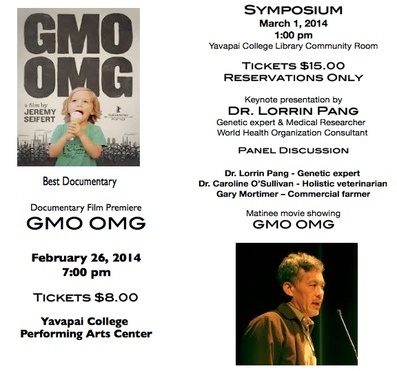 The premier showing of ‘GMO OMG’, a new documentary by filmmaker Jeremy Seifert, will be hosted by GMO-Free Prescott and Yavapai College Community Education on Wednesday, February 26, at 7 PM. The film will be shown at the Yavapai College Center for the Performing Arts, 1100 E. Sheldon St. in Prescott. Advance tickets are available by calling 928-717-7755. The cost is $8.00; free admission for children under 18 who are accompanied by their parent. ‘GMO OMG’ is a family film in which a concerned father searches for answers to: How do GMOs affect our children, the health of our planet and our freedom of choice? And perhaps the ultimate question, which Seifert tests himself: is it even possible to reject the food system currently in place, or have we lost something we can’t gain back? These and other questions take Seifert on a journey from his family’s table to Haiti, Paris, Norway, and the lobby of agra-giant Monsanto, from which he is unceremoniously ejected. Along the way we gain insight into a question that is of growing concern to citizens the world over: what’s on your plate? The film will be followed by and a Q & A session. GMO-Prescott is a partner of Sustainable Arizona, a 501(3)(c) nonprofit and is committed to promoting grassroots efforts that encourage informed and nourishing food options and choices. For more information, email gmofreeprescott@gmail.com. There will also be a symposium on the topic. Please refer to the flyer for more information.